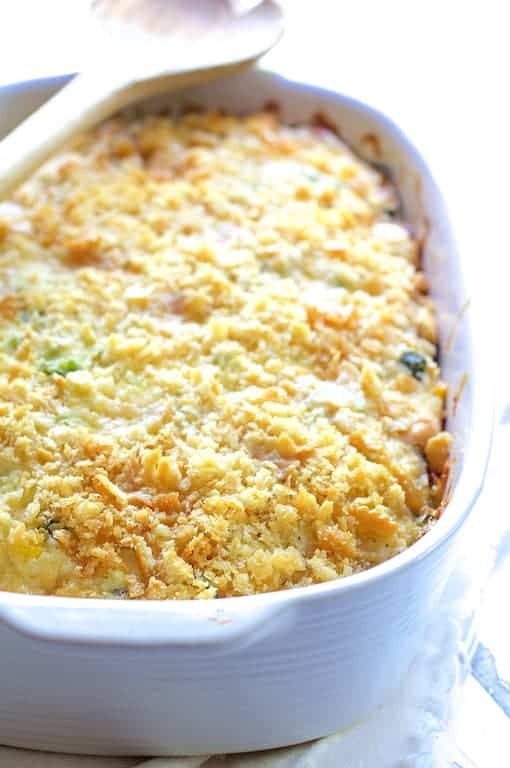 One thing Southerners do better–more than anyone else in the world–are casseroles and they do them with such love. When someone is in need, their food situation is one of the first things addressed. A great Southern casserole will most likely be heading that needy person’s way. It seems I’ve had a lot of leftover grilled zucchini in my life lately. I had to redo a couple of sliced zucchini shots for my Cream Cheese and Artichoke Stuffed Tomatoes and Grilled Zucchini post and had plain sliced zucchini afterward so I grilled it for a purpose I had not yet determined. I then did a Grilled Zucchini and Spinach Lasagna for a client a few days later and ended up with more. 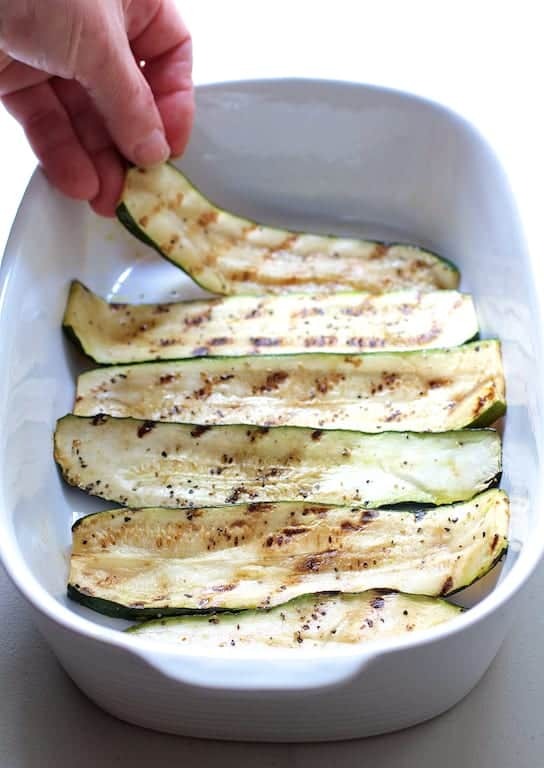 Grilled zucchini is great on pizza or pasta, but some Southern comfort food won out! You don’t need to grill zucchini first for this casserole–just if you want to. Alternately, you can slice the zucchini then saute or roast until crisp-tender. 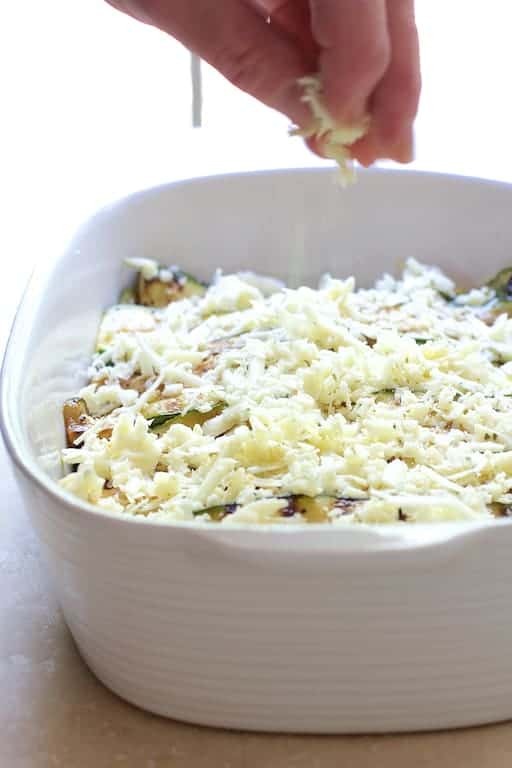 Zucchini needs to be cooked a bit before placing in the casserole as it brings out the delicate flavor. I don’t recommend boiling it. Boiled zucchini is just….wrong. Feel free to use yellow squash or a combination. I used frozen corn but use fresh if possible. The corn is starting to look amazing at the local markets. Some grilled corn is definitely on our menu this Fourth of July! In addition to all this creamy, cheesy veggie goodness is fresh jalapeño for a little heat. Leave it out or use mild canned diced green chiles or sweet bell pepper if you don’t like spicy food. Two things a proper creamy Southern casserole needs that you don’t want to skimp on are mayonnaise and a butter cracker topping (such as Ritz or Townhouse crackers). And cheese. Must have cheese! 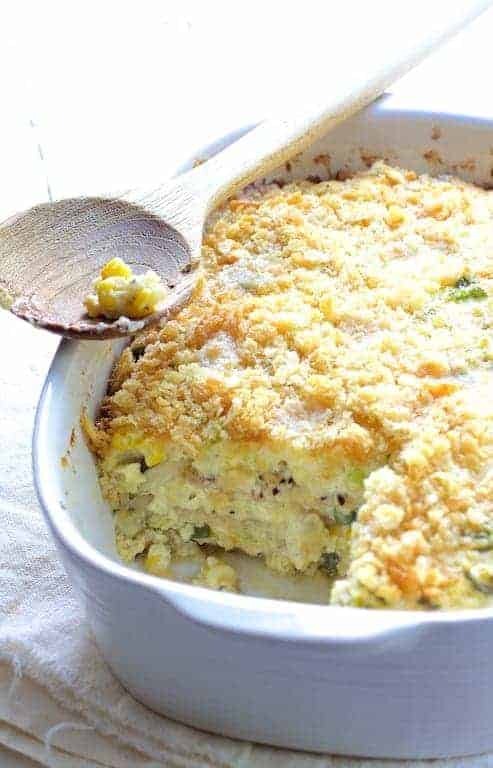 Layered Zucchini Corn Casserole is rich and wonderful! After all, it’s Southern! Now let’s eat! Butter, oil or spray a 2-quart baking dish. Set aside. Heat butter over medium-high heat. Add the scallions and jalapeno and cook 3-4 minutes just to soften. Add the garlic and cook 10-15 seconds or until fragrant. Transfer vegetables to a bowl. Add the cream cheese to the hot vegetables and stir until it's creamy. Stir in mayonnaise, milk or half-and-half, eggs, salt and pepper and blend until creamy. Place a layer of zucchini (1/3) at the bottom of prepared baking dish. Spread 1/3 of the corn over the zucchini, spread 1/3 of the egg mixture over the zucchini and corn, then 1/3 cheese. Repeat two more times. Sprinkle crushed butter crackers over the top. Cover loosely with aluminum foil. Bake 30 minutes. Remove foil and bake another 30 minutes or until bubbling and crackers are lightly browned. Let rest 10 minutes before serving. MAKE AHEAD: Can be assembled 1 day ahead. Let sit at room temperature for 30 minutes before baking or increase baking time 5-10 minutes if placing cold from the refrigerator into the oven. Do you have nutritional information for this recipe, such as calorie amount? Hi, Amy, I don’t at this time but I will be adding that information in the near future. I’ll make this recipe a priority. Thanks so much! Made this casserole last night and everyone loved it. Grilling the zucchini first really enhanced the flavor. This is a definite keeper. Thanks for a great recipe. Thanks so much, Jan! So glad you and your crew enjoyed. Please stay in touch! Do you think this would work with the zucchini shredded and mixed in with everything instead? I tend to prefer the texture of shredded zucchini. 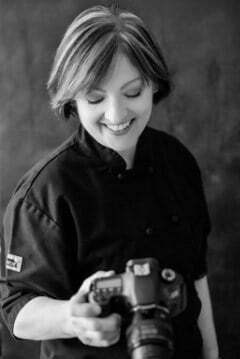 Hi, Melissa, Thanks for your question. Yes, it should work. Shredded zucchini is going to be pretty “wet” so you’ll want to drain it with some salt or cook it first. Thanks again, hope you enjoy and please let me know how it worked for you. I made this casserole and it is good, but it took me a lot longer than 30 minutes prep time. Thanks, Lindy! Glad you enjoyed. I’ll increase the prep time but it’s an average and will vary person to person. Thanks again and please stay in touch. As a South Louisiana girl, I appreciate a great casserole and this looks amazing. So glad to have stumbled onto your site. Thank you. Thank you, Carol! Glad you stumbled onto my site, too! Please stay in touch! YUM! 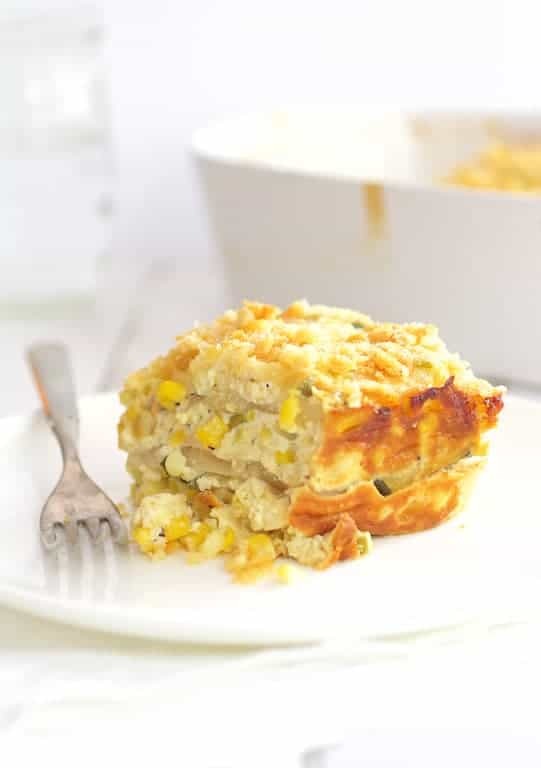 Totally loving this summery twist on your usual corn casserole! And what a stinking genius idea for all of the season’s zucchini! Thanks, Karly! It’s pretty tasty. Hope you enjoy and please stay in touch! It looks sooo good. And you are so right about the south. They do love their casseroles and they are very warm about sharing food whether it is happy times or sad. Isn’t that great?? Food is a common denominator — we all eat. Now, to tell you the truth my mouth is watering looking at your casserole. Have a Happy Independence Day! !